Imagine if you will a world that his hostile to human life. Everything has adapted, from the leaves of grass to insects to larger animals, for the sole purpose of destroying the human colonists The planet has double Earth's gravity, has unpredictable violent weather, earthquakes, and more. The colonists are losing the war for survival, but refuse to leave for one of the more hospitable worlds. Welcome to Pyrrus. Something whizzed in through the open window, tearing a hole in the protective screen. Kerk blasted it without changing stride, without even knowing he had done it. The decision didn't take long. Geared to swift activity, the big Pyrran found it impossible not to decide quickly. Good thing that wasn't available in the old West. As with most science fiction, a substantial amount of suspension of disbelief is necessary; the evolutionary concepts do not withstand scrutiny, in addition to other elements of the book. Nevertheless, it's an interesting story. "I'm not being insulting when I say 'confused,' Meta. With your background you couldn't be any other way. You have an insular personality. Admittedly, Pyrrus is an unusual island with a lot of high-power problems that you are an expert at solving. That doesn't make it any less of an island. When you face a cosmopolitan problem you are confused. Or even worse, when your island problems are put into a bigger context. That's like playing your own game, only having the rules change constantly as you go along." "You're talking nonsense," she snapped at him. "Pyrrus isn't an island and battling for survival is definitely not a game." "I'm sorry," he smiled. "I was using a figure of speech, and a badly chosen one at that. Let's put the problem on more concrete terms. Take an example. Suppose I were to tell you that over there, hanging from the doorframe, was a stingwing—"
Meta's gun was pointing at the door before he finished the last word. There was a crash as the guard's chair went over. He had jumped from a half-doze to full alertness in an instant, his gun also searching the doorframe. "That was just an example," Jason said. "There's really nothing there." The guard's gun vanished and he scowled a look of contempt at Jason, as he righted the chair and dropped into it. "You both have proved yourself capable of handling a Pyrran problem." Jason continued. "But what if I said that there is a thing hanging from the doorframe that looks like a stingwing, but is really a kind of large insect that spins a fine silk that can be used to weave clothes?" The guard glared from under his thick eyebrows at the empty doorframe, his gun whined part way out, then snapped back into the holster. He growled something inaudible at Jason, then stamped into the outer room, slamming the door behind him. Meta frowned in concentration and looked puzzled. "It couldn't be anything except a stingwing," she finally said. "Nothing else could possibly look like that. And even if it didn't spin silk, it would bite if you got near, so you would have to kill it." She smiled with satisfaction at the indestructible logic of her answer. "Wrong again," Jason said. "I just described the mimic-spinner that lives on Stover's Planet. It imitates the most violent forms of life there, does such a good job that it has no need for other defenses. It'll sit quietly on your hand and spin for you by the yard. If I dropped a shipload of them here on Pyrrus, you never could be sure when to shoot, could you?" On my first reading about mumble mumble years ago, the word "stingwing" stayed with me, and I've used that in reference to hornets and the like, but that's not important, just fun. This excerpt about 2/3 of the way into the book got my attention. Although we don't have a mimic-spinner, we have a passel of evolution-defying critters right here that use mimicry. Some are predators, and some are disguised for their defense. 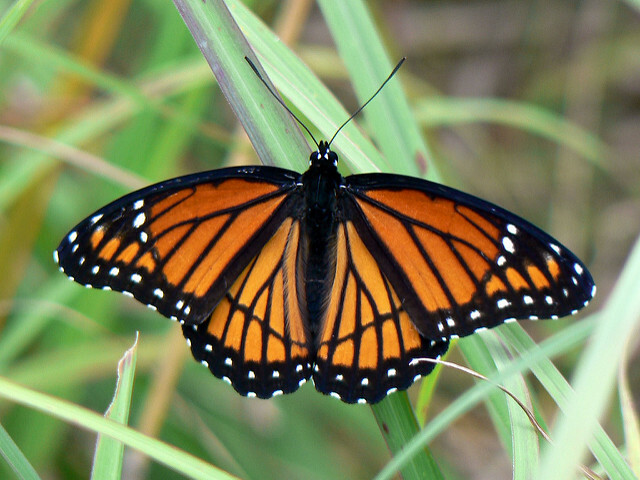 The viceroy butterfly looks a great deal like the monarch. That's a good thing, because birds don't like monarchs — they taste nasty. Other butterflies leave a bad taste in someone's mouth, and they get mimicked as well. Imagine a cowboy in arid regions getting startled by the sound of a rattlesnake. Sorry, Pard, you got hoodwinked by a young burrowing owl! Speaking of owls, many people have noticed that mourning doves sound a lot like an owl, which works to their defense. So far, the only thing I can find for the white wing dove saying, "Ooh, baby, ooh" is in a Stevie Nicks song, so that doesn't help us a whole lot. Then there's the orchid mantis. It's what the name implies, a mantis that looks like an orchid, and waits for lunch to arrive. This mantis gets a bonus because not only because its appearance is useful for predation, but defensive as well. Way down yonder in the deep blue sea is the mimic octopus. This quick-change artist can look like a predator to its own predator — different ones at that, as the situation requires. Let's go back to the rattlesnake — sorta. Seems like the rattler is a popular object of imitation, like the young 'uns of the burrowing owl showed us, and also like the gopher snake. He wants us to think he's a bad boy with his rattler markings, triangular head, coiled pose, even striking like he has a poisonous bite — and the rattle. But he doesn't have one. The sound actually comes from an organ it its mouth. These creatures sound like something out of fantastic fiction. There are many other fascinating things among plants, insects, animals, and so on that could make this list very long indeed. Of course, secularists give praise to evolution ("Evolution did it! Blessed be!") without a plausible mechanism, and not praise to the Creator who gave his creation special abilities, including adaptation when needed. Let me know if you find a mimic-spinner, but watch out for stingwings.